We got the purse display up at The Museum of Woman’s History yesterday. I will post pictures once they get posted on the Museum’s Facebook page. I promised I would share some of my odd purses with you. For those of you who are new here, I have an unusual purse collection. I display them at the Montana Fair every year. This year, I want to make the display different. Instead of just slamming purses in a display, making them a bit more fun. Any cool ideas you have for displaying them for the Montana Fair are most welcome. For example theses are how I plan on displaying a couple of them: My Chinese take-out purse will have chopsticks next to it. 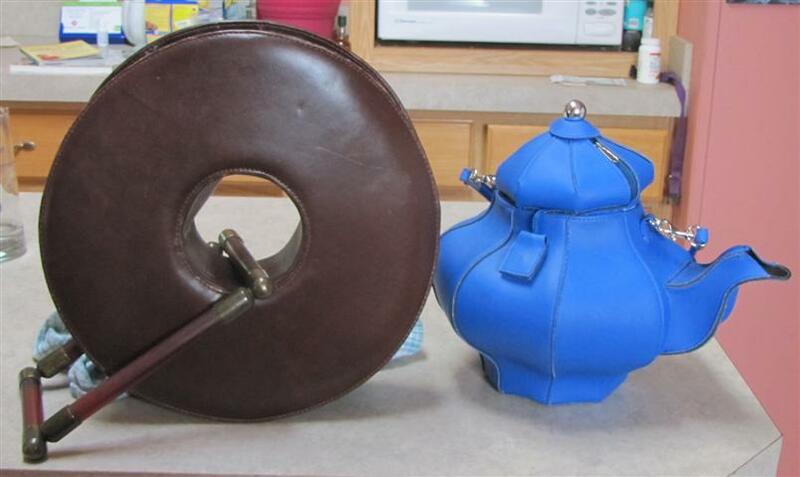 My teapot purse will have a teacup next to it. What would you do to jazz these purses up? Click on the pictures to make them bigger. 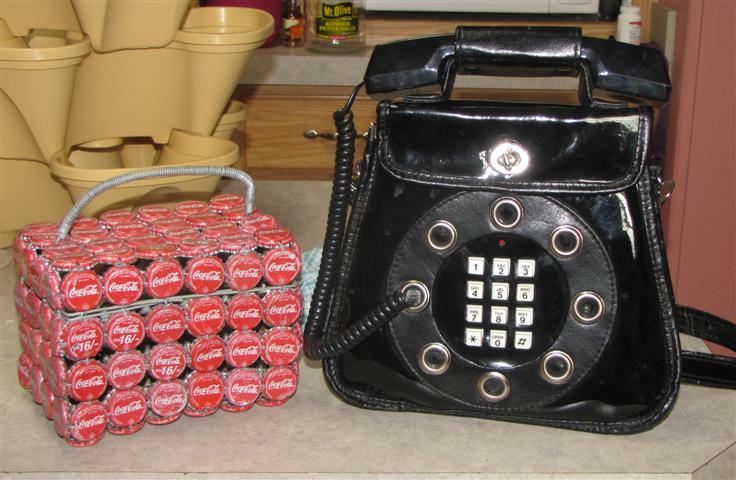 The purse on the left is made out of coca cola bottle caps. The handle is a long spring from a screen door. 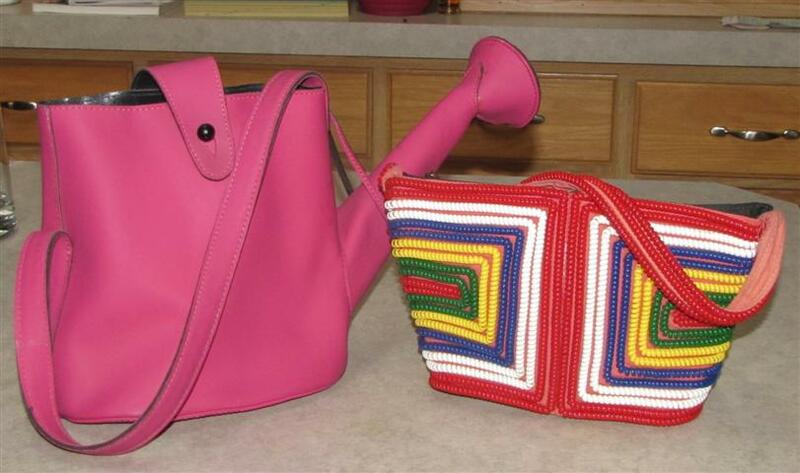 The purse on the right is one of my favorites. Its a real working telephone. The handle is the receiver. There is a phone jack inside the purse. Just plug it in and push the buttons on the front of the purse to call out. Someone was selling it on Ebay and didn’t know what they had. Which allowed me to pick it up for less than they normally run. 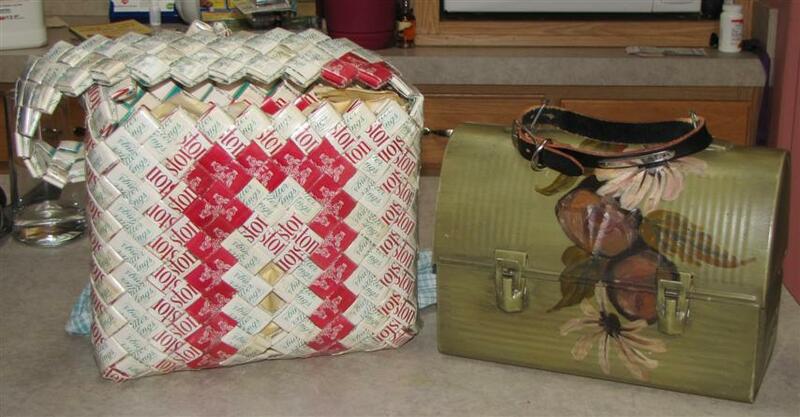 The purse on the left is made out of cigarette packs. Prisoners uses to make “prison art” out of the packs. They would make purses, picture frames and so on. This one is from the 50′s I’m guessing. 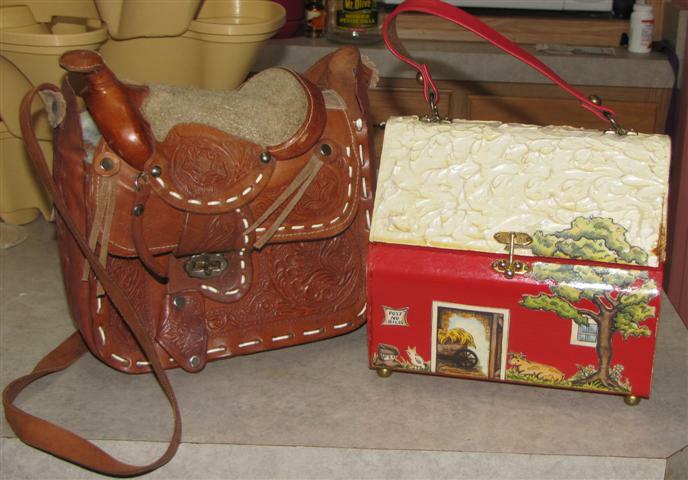 The purse on the right is an old lunch box that someone jazzed up. The inside has green fabric and rick-rack. The purse on the left is a real taxidermy armadillo. Isn’t that both cool and creepy? 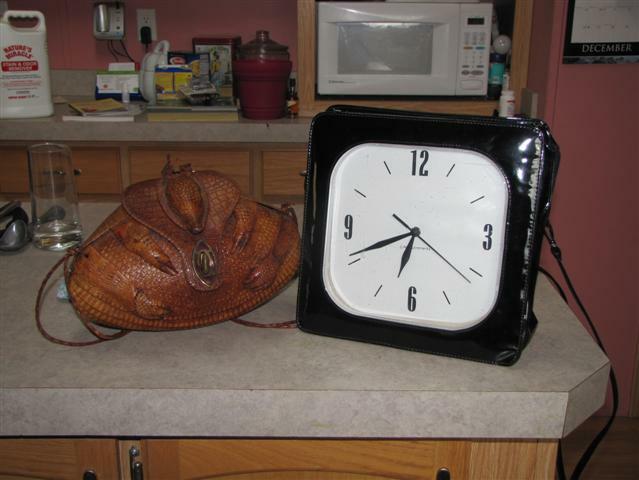 The purse on the right is a real working clock. I found it at a sidewalk sale my first year in Billings. It didn’t work so it was on sale for under 7 bucks. I brought it to Mr. Bernie and he fixed it. Yea! I have no idea what this round purse is supposed to be. Its leather and fun. Granted it doesn’t hold much, but there you go. Beth Ann, here is my teapot purse. They don’t make them anymore. However, they can be found on Ebay. Living in Montana, I needed a saddle purse. It took me a while to find one that I could afford. The barn purse I found at our local thrift store. It’s from the 60′s when decapodge was so popular. Every side has some kind of scene on it. Its good and semi heavy. 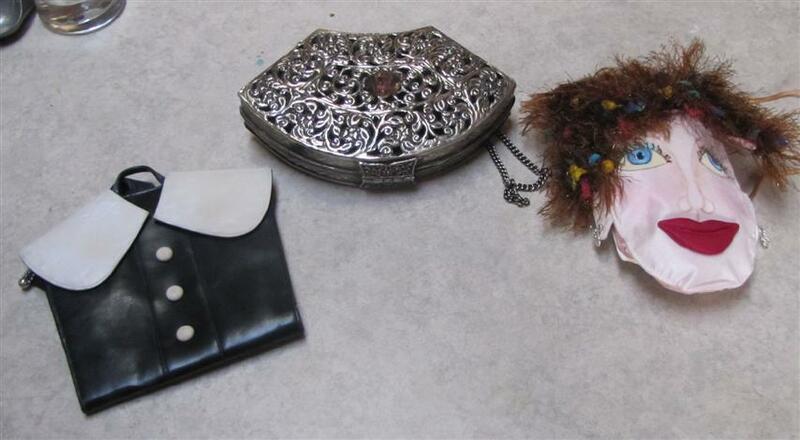 The little purse on the left my cousin gave me at my wedding shower. I think its cute. The middle one is metal with an amethyst in the middle. The last purse was just so weird I had to have her. Don’t you just love her hair? There is a pocket on the back for a cell phone. These are two other purses I wanted, but had to hunt around to find at a reasonable price. I’m not a big football fan, but its a fun purse for the fall. The car was adorable and I had to wait until I could get my grubby hands on one. Guys really like these purses. The watering can purse is one of my all time favorites. Mr. Bernie bought it for me when he became a Master Gardener. All together now, “Awwww” There are hooks in my display case.I want to have it hanging and have it look like water is pouring out of it. Any suggestions? One time some Walmart greeter tried to put a sticker on it, claiming I was returning it. I told her it was my purse and so I didn’t need a sticker. She was confused. The other purse, Michele bought me for my bridal shower. I had wanted one forever! Its made out of old phone cords. My kitchen sink purse. I’m thinking of a Barbie standing next to it, looking like she is washing dishes. My problem is what can I put in the sink that would look like suds or bubbles? Any suggestions? and find out each of the benefits which it has to offer. 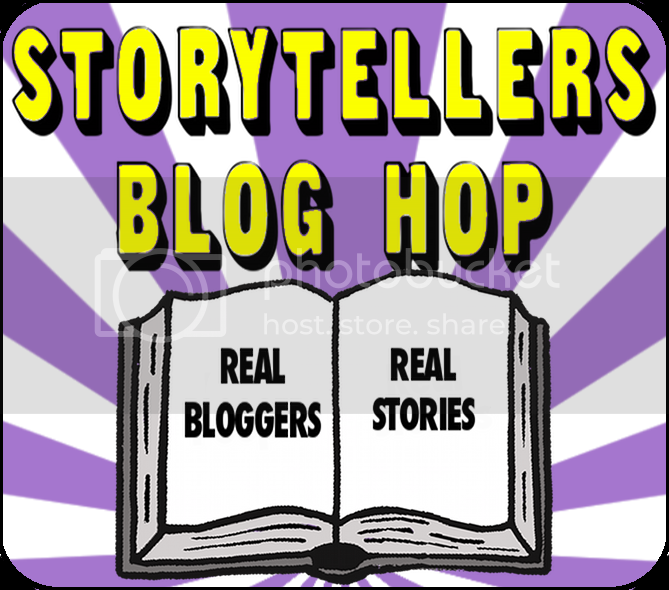 I just happened onto your blog and LOVE these! I gotta get me a telephone purse. Probably will pass on the armadillo though. I enjoy finding purses at thrift stores but had no idea you could do all these cool things with them. Thank you. Ebay used to be my best friend. I would put in XXXX purse and usually something would come up. I haven’t bought a fun bag in a few years. However, I’m always on the lookout!! Thank you. Since I’m not a little thing that can buy cute clothes or shoes, I go for the purses. hrm these are hilarious AND amazing ! The kitchen sink on is unreal…maybe you could use blue and white marbles for bubbles ? Thank you. That is a clever idea. I will have to look into that. hrm these are hilarious AND amazing ! The kitchen sink one is unreal…maybe you could use blue and white mini marbles and hot glue them in there ! That round one may be a chocolate doughnut. What do you think? Maybe? there is a spray foam used to fill cracks and holes as insulation material it bubbles up . I think you would have to line your sink with saran or something first. Spray is available at home improvement stores. Note: it grows as it sets -be careful not to overfill. I liked the bubble wrap idea too. Thanks for the idea. I know when I used that stuff at my house in Duluth it would turn yellow after a bit. The saran wrap is a wonderful idea of how to keep the sink from getting icky. Love it. What a collection…I am amazed and intrigued….so glad I did not miss this…. Thank you for stopping by. Its neat to have people appreciate them. Holy cow! Your collection is incredible Bernie, truly. I couldn't have even imagined some of those when you talked about all your purses. Really so cool! Thank you. Part of the fun is the hunt. What interesting purses you have!!! Maybe you could incorporate one of those old bottle openers, into the display of the coca-cola purse? Maybe a small square of felt could be used to look like a dishcloth at the kitchen sink, and maybe some cotton balls / cotton strips can be used to look like suds. I have the perfect tiny tiny toy bottle of dishsoap from a Barbie sink that would look cool sitting there! Great ideas! Thank you. Love the bottle opener one. Lots of great ideas from everyone ! The only one I could come up with is to make sure you have several levels to display your purses on so they aren’t on just one long flat surface and to build a backdrop of some sort and go from there. Really like the one that’s made from- what was it? old phone cords? – very colorful : D Good luck with the show. Thank you. My purses are displayed in a glass display case. The fair has several cases around a large room. Almost like a curio cabinet type of thing. Those are the most incredibly unique purses I've ever seen. WOWZA! Thank you. Its fun to carry them and get the reactions from folks. Dude! I love these.. Bernie, you're so freakin' cool. these purses prove it beyond a reasonable doubt. My favorite is the saddle purse. I think you should have a little stuffed animal cowboy riding it in the display. heheh. Dude! I\’m glad you like them. Thank you, its a fun collection. Sink purse – make it look like there is soapy water in the sink and have small toy dishes on the drain board area. Maybe put a small dish towel under it. 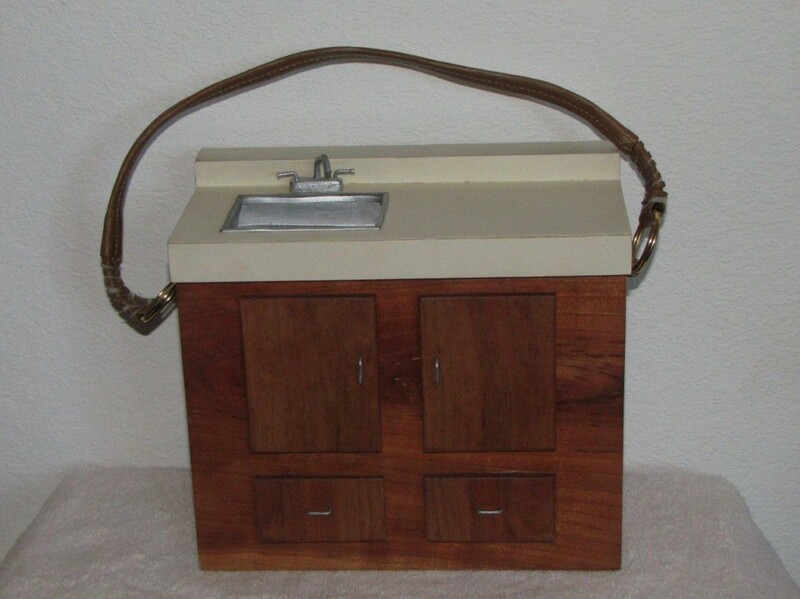 I would put the cigarette pack purse surrounded by old ash trays filled with match books. The car is easy, get a kids car mat to put it on. Oh, the nickle and dimes on the phone books are cool. Love the idea for the ashtrays with matches. I never thought about putting time books with the clock purse. Clever. Hahah, I love all of these!! They are too cute. The phone one would match so many of my things. Maybe I can make one on my own?! Go for it! The inside has the jack in it. It would be a fun project for you. I can't believe you own all those! Their crazy! I'm at a loss with display suggestions. Nina's got some great ideas! I think the armadillo would be interesting (for lack of a better word) next to a small size tire and a taxidermy book, maybe how to taxidermy road kill. Oh, love the book idea. I will have to look for one of those. What a fantastic collection! I will have to think about ideas…though artsynina seems to be on top of things! The more ideas the merrier! Oh, and the watering can purse. Maybe you could find plastic streamers in clear or blue (like the stuff cheerleader pom-poms or bicycle handlebar streamers are made from) to hang down from the spout. OK, gotta go. Little Guy knows I'm busy typing – it's his cue to get into as much stuff as possible as quickly as possible! Oh, the streamers are a good idea. Mr. Bernie suggested tinsel but streamers would come in colors. Let's see… the phone purse would be great with a phone book. I'm not sure how much space you have, but you could use old panes of glass, glass from picture frames, or something to make something that looks like a phone booth? You could display the phone chord purse along with it. The armadillo need tumbleweed, maybe a tire, like it just got run over? LOL! The big circle-y purse looks like a chocolate-covered donut to me. Maybe a Dunkin' Donuts coffee cup and a giant plate? For the sink one, some cotton would work really well for bubbles. Depending on how big the sink is, you might even get away with bubble wrap or clear, shiny marbles! I love the metal w/amethyst purse! It must be heavy, though! Michele suggested a phone book as well. The problem would be finding either an older one or a smaller one. Clever idea with the tissue paper and cotton balls. Ohhhhh I wonder how hard it would be to find one of those long cigarette thingies. I know what you are talking about. Great ideas. Thanks for suggesting them! You do have quite the eclectic collection, don't you? Thinking just a little bit here…how about putting the cigarette purse behind bars? I assume you're tagging the purses with explanatory info. Pair the cola purse with a fake hamburger and fries. The mini clasp purse with the amethyst speaks vintage to me. I could see it paired with your vintage cards. Sneak in a business card too. Oh, the possibilities. What a fun, fun project. That is clever, behind bars with the cigarette one. We don\’t get to put up info with these. I don\’t know why, but nobody does it. Thank you so much for the ideas. I was thinking a pizza box next to the coke cola purse! Of course, silk flowers in a pot with the watering can purse over it. Or you could put the sink purse under the watering can. They really are just so cute! Thank you. Oh, a little pizza box next to the coke. I like it. And that litte collared purse belongs in some sort of Pilgrim or Puritan display! OK. I'm commenting out of control. I'll stop now. No, no. I need ideas. Comment away. Bernie, If I were in Montana I would be your Purse Exhibit Curator. lol I would make a vintage kitchen wall around the clock purse. And I'd lay the armadillo purse on cowhide or something. And the saddle purse should be next to cowboy boots. Oh the ideas! Well you are more than welcome to make a little vintage wall for the clock purse and I can pick it up when I come home. *lol* Oh, cowboy boots is a cool idea. Thank you! I can do that. Thanks for the link too. I am so glad you posted pictures. And you know which one is my favorite!!! The only thing that would make it better would be if it was RED! The watering can one is adorable and even more so since Mr. Bernie gave it to you. How about attaching some tinsel or shining stuff out of the spout to look like water???? Just a thought. The armadillo is kind of creepy, I agree. As long as it was not scraped off the road…..
Mr. Bernie said: \”How do we know it wasn\’t scraped off the road?\” *lol* They do have red teapot purses. You need to find on and get it for your teapot collection. If I run across one online I\’ll let you know. That a girl. Just another thing for you to keep you off the streets.